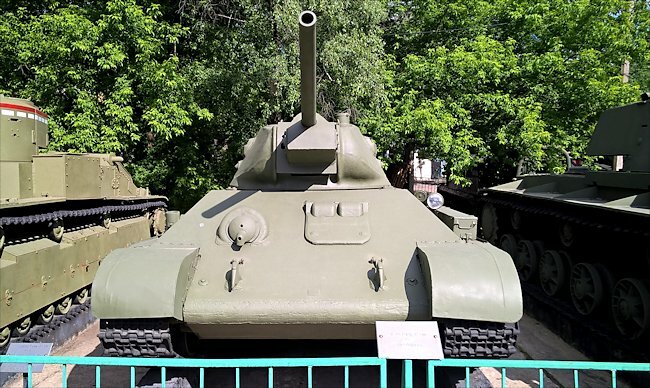 There are two T-34/76 Soviet WW2 Medium Tank you can visit in Moscow. 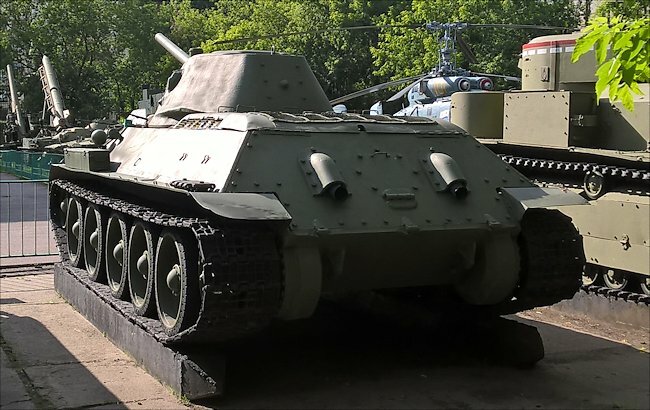 One is at the Central Armed Forces Museum and the other at the Central Museum of the Great Patriotic War 1941 - 1945, Park Pobedy. 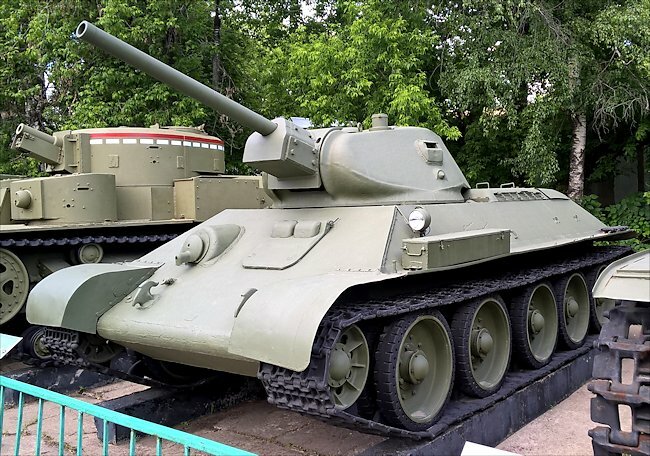 Outside of Moscow there is a third at the Tank Museum in Kubinka. In 1941 the Soviet tactics or sending wave upon wave of massed tanks unsettled the invading Germans. They were surprised at how effective the new Soviet KV-I heavy and T-34/76 medium tanks. They had difficulty knocking them out and found their tanks armour lacking in protection. German 4th Panzer's losses on the Eastern Front of ten tanks, two 88 mm guns, one 105 mm howitzer, and one 100 mm gun were far from crippling, and had to be set against the destruction of 18 enemy tanks. But the effects of this, the first major encounter with a mass of the latest Russian machines, were far-reaching. The Germans still frequently demonstrated that they were far ahead of the Russians in training, technique and execution of imaginative ideas. Yet in tank technology the Germans were far behind in firepower, protection and mobility. In 1941 in a tank-versus-tank battle they were out-classed. To begin with, the check on this front, imposed by a coherent Russian defense, had repercussions elsewhere as German lines of communication began to collapse in alternating conditions of blizzard and frost, thaw and glutinous mud. Stop-go killed off the German momentum and presented the Russians with invaluable time and opportunities to assemble fresh forces to create new stop lines protecting the obvious enemy objective, Moscow. Within a matter of months, Panzer III and IV tanks were to have their armor thickness doubled by the addition of face-hardened, spaced plates; and their guns improved, respectively by the L60 50mm and a very good 'long', L43 75 mm piece with a muzzle velocity of 700 m/sec (2300 ft/sec). Simultaneously, pre-war design projects would be up-dated to put into production a 56-ton tank, armed with an 88 mm gun, the Tiger I, and a medium tank of 43 tons with sloped armor and an L 70, 75 mm gun, the Panther D.
Red Army Soviet WW2 T-34/76 m1942 Medium Tank at the Museum of the Great Patriotic War 1941 - 1945, Park Pobedy in Moscow. Produced at Factory No.183. Notice the upgraded turret. Tracks would be made much wider to help match the superior cross-country performance of the wide-tracked KV-I and T-34/76 tanks. None of these improvements, however, were ready in time to save the Germans from the bitter winter ahead. German narrow tank tracks of too high a ground pressure sank in the mud and, frequently, were then frozen in solidly before the vehicles could be dragged out. German vehicles were not prepared for the bitter Russian winter temperatures unlike the Red Army tanks. German fuel and lubricants in such low temperatures froze, as did engine coolants of insufficient density. Those which were sent back to the fatherland by rail for overhaul usually arrived at their destination stripped of nearly everything movable and in need of a rebuild. 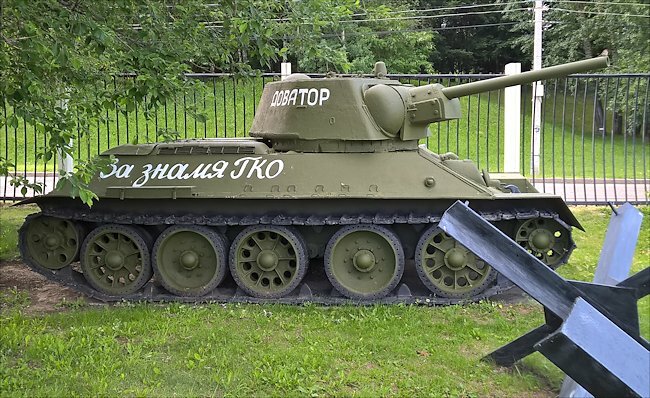 Where can I find surviving T-34/76 Tanks?